The sound of a healthy V8 is music to the ears of a serious classic car collector. Aromas of oil, gas and rubber ignite passions and stir images of drag racing while lustrous paint jobs and polished chrome fill these collectors with pride and joy. All of these senses are heightened at the 20th annual “Hot Rods & Harleys 2019 Spring Run,” hosted by the River Cruizers Car Club. Everyone is invited to come out and partake in the four-day event at the Avi Resort & Casino, Thursday-Sunday, April 11-14. The word “hot rod” refers to the replacement of “hotter” parts to make a new version of an automobile. The modification of removing parts to reduce weight or “channeling the body,” changing of wheels and tires to improve traction and handling, or altering car bumpers, hood, and fenders to improve appearance began after World War II and continued well into the 1960s, when “hot rodding” became a lifestyle. Harleys are heavy motorcycles, which were designed to be rebuilt and rebuilt again, perfect for guys who like to tinker and take the idea of “what if” to a different level. The design was kept simple so any enthusiast could modify it to his or her own taste and imagination. The Harley is all about open roads, camping spots, road houses, group rides with like-minded friends and diners with comfort food. That love of classic cars and bikes is deep-seated. Maybe it started by hanging out in the garage with a dad or big brother. Or maybe it came about through a developed friendship among those with a shared interest. And then again, maybe it started back in the day when guys found out girls liked good-looking cars and if they just had a good looking ride, well…. No matter how or when it happened, that passion for the automobile never has waned. It’s not so much like fashion trends that come and go, classic cars become part of a person’s life for the long haul. As most car enthusiasts age, they tend to have more money and time to apply to restoring these cars and motorcycles and showing them off by attending the many car shows that spring up across the land — just like the annual Hot Rods & Harleys show at the Avi’s “grassy beach area” behind the casino. In addition to sharing their passion for old cars and enjoying the camaraderie of the club, members of the River Cruizers particularly like doing the good deeds that come with all the rest of it. Over the years, this long-standing car club in the river cities has donated more than $500,000 to local programs and organizations including the Military Wives Program, the Veteran Outreach Program, food banks, the Mohave County Sheriff’s K-9 Unit, senior programs, Toys for Tots, youth sports, Special Olympics, Clothe-A-Child, and the scholarship program for graduating high school seniors from every high school in the area. A way to help this year is purchasing raffle tickets to win a 1976 Chevy Blazer. Tickets are $20 each. The truck has a 350 engine, 3,000 miles, is in excellent condition inside and out, and the vehicle was pre-owned by a veteran. The winner doesn’t have to be present to win, but he or she must take ownership within 30 day of winning and the person will be responsible for transport. For tickets, call Louie 661-289-0352 or Fred at 928-514-5063. Approximately 300 vehicles are expected for the “Hot Rods & Harleys” show at the Avi, competing in categories to include hot rods, classics, motorcycles, vintage bikes, trucks, rat rods, and others. About 34 trophies are awarded. The grassy area where the cars and bikes are displayed is the Beach Overlook at the Avi near the lagoon pool with the Colorado River as the backdrop. Event registration is Thursday, April 11, and Friday, April 12 (9 a.m.-5 p.m.); and Saturday, April 13 (9 a.m.-11 a.m.) — no registrations accepted after 11 a.m. The entry fee for anybody wanting to display a vehicle is $50 for hot rods, $25 for motorcycles. Entry includes a goodie bag, a T-shirt and dash plaque, a chance at door prizes, music, parking on the grass by the river, class awards and 24-hour security. There also is a special room rate for participants. There are activities for both participants and spectators, including a 50/50 drawing, raffles, door prizes, a poker walk, and more, daily. All the fun and games and polished chrome have a good cause going on behind them. Formed as a nonprofit organization in 1989, the River Cruizers are one of the area’s most ambitious fundraising groups. The Avi show complements the club’s other annual shows, the “Roddin’ on the River Car Show” held at the Riverside Resort in September and their “Cruizin’ on the River,” also held at the Riverside Resort in January. For those interested in joining the club or finding out more about it, visit the River Cruizers website at rivercruizers.com; or attend one of the club’s meetings on the first Tuesday of the month at 7 p.m. at Casa Serrano Mexican Restaurant (in the Banquet Room) at 5230 S. Highway 95, in Fort Mohave, Arizona. • Gates open/parking open to all participants (7 a.m.-6 p.m.), after the show hang out as long as you want to enjoy the Avi beach, resort, and more. • 50/50 drawing (5:30 p.m.), (must be present to win 50/50). • 50/50 tickets sales (9 a.m.-4 p.m.; drawing 5:30 p.m.); (must be present to win). • Poker Walk registration in the DJ tent, (9 a.m.-10:30 a.m.). The walk starts inside the casino (11:30 a.m.-noon). It is open to the general public at $5 per hand. Participants will walk a course inside the Avi property picking up playing cards at each of the five designated stations. When they complete their walk, they will compare their five-card hands. Those holding the best poker hands will win cash prizes. The money collected from the entry fees will be awarded to the top three hands. • Awards presentation in the registration tent, (8 a.m.). 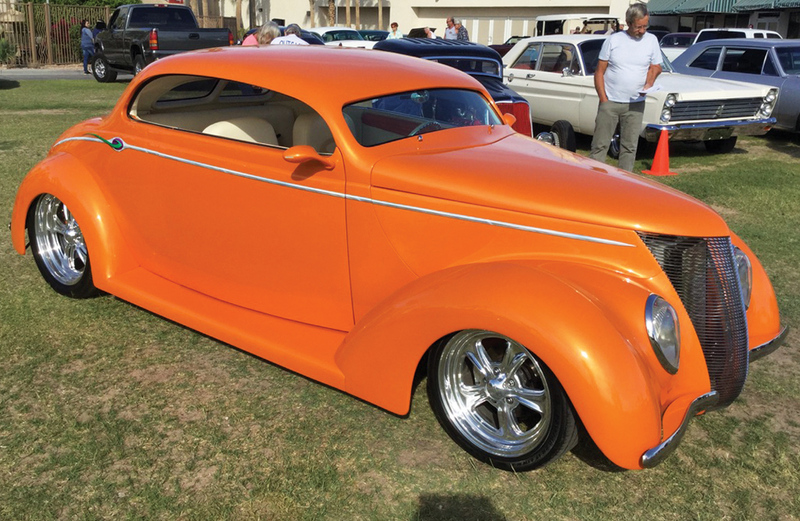 Coffee and doughnuts, all cars and bikes take off by 10 a.m.
For more information about the car show, contact Louis Giancanelli, by calling 928-577-2182 or email: myranch101@yahoo.com. For room reservations at the Avi, call 1-800-284-2946. The River Cruizers are trying something new this year, offering a “Donation Table,’ versus a “Gate” like they do at the Riverside Resort. They will be manning a table with literature about their club and some freebies. The usual donation is $2 per adult, and children are free, however, any amount helps with their mission to help local charities, organizations and to provide scholarships.